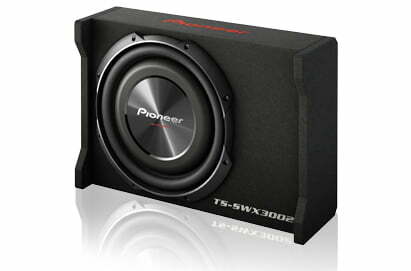 The shallow-mount subwoofer that comes preloaded in the Pioneer TS-SWX3002 utilizes an oversized cone structure that provides greater cone and gasket surface without changing its standard external dimension. This cone surface allows the subwoofer to produce louder deeper bass by moving more air. It is made of highly rigid cone made of MICA injection-molded resin which creates a rigid and durable cone, giving it the ability to produce accurate bass. The subwoofer includes a dual spider to provide more cone motion control for optimized stiffness stabilizing the excursion of the cone and support the subwoofer’s linear movement for accurate bass response.